With over 8 generations of grape growing and agriculture production, the Merrill family has been servicing the Central Coast since the 19th century. With an initial 40-acre vineyard that has expanded to 600-acres and counting, Pomar Junction is emblematic of the Central Coast wine tasting culture shift. 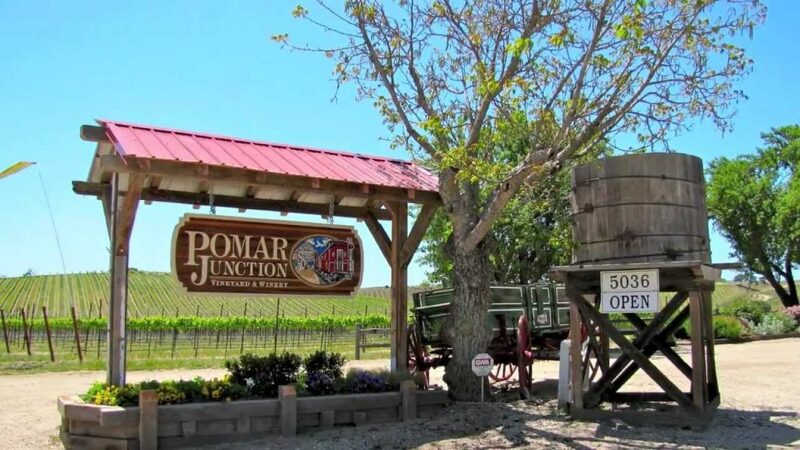 With over 15 medals awarded to their wines in each of the Series, you can’t go wrong at Pomar Junction. Choosing between the Double Gold Winner 2016 Sauvignon Blanc and their Gold Medal 2016 Blanc may be the hardest choice of your week. Pomar Junction’s eloquent series of wines: Artist, Estate, or Reserve makes for a pleasurable experience with the aid of knowledgeable and friendly tasting room associates. They showcase a white peach, spiced pear and orange blossom scented Rhone in their Artist Series, among other award winning vintages. Arrive in fashion with friends and enjoy the scenic views off the beaten path of Paso Robles. Pomar Junction offers a beautiful tasting room, lined with locally made honey and more. With an outdoor patio and Parisian style table, you can enjoy the warm summer Central Coast air while sipping your favorite bottle of wine. Want to get sidetracked? Board their vintage train car posted out back with your bottle of wine. Live in luxury and book a night in one of Pomar Junction Winery’s guest houses. Choose between a 1 bedroom, 900 square foot cottage for a romantic getaway, or a 3 bedroom house for your fun group of friends or family! The Vineyard Venue also offers a spectacular Paso Robles-style backdrop for weddings, with luxurious transportation for your wedding party available as well. Thinking about a wine tour in Paso Robles? Check out our quick guide to wine tasting etiquette on the Central Coast, and 5 Reasons Wine Wednesday is Important!